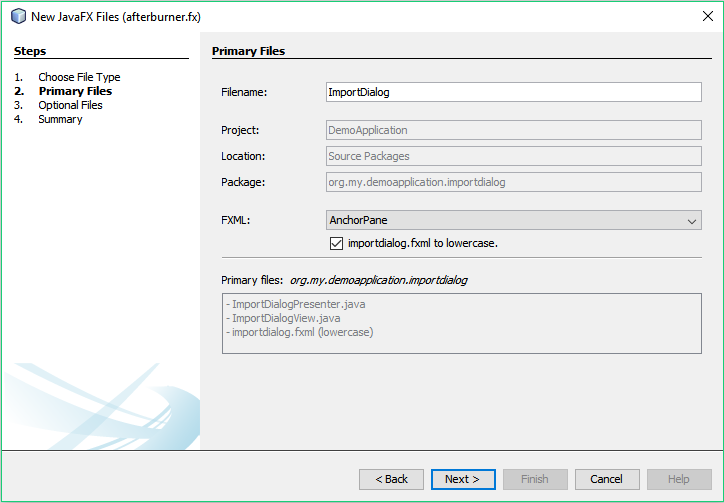 The NetBeansIDE-AfterburnerFX-Plugin is a NetBeans IDE plugin which supports the file generation in convention with the library afterburner.fx in a JavaFX project. Welcome to `NetBeansIDE-AfterburnerFX-Plugin` with the new release `v1.5.0`. 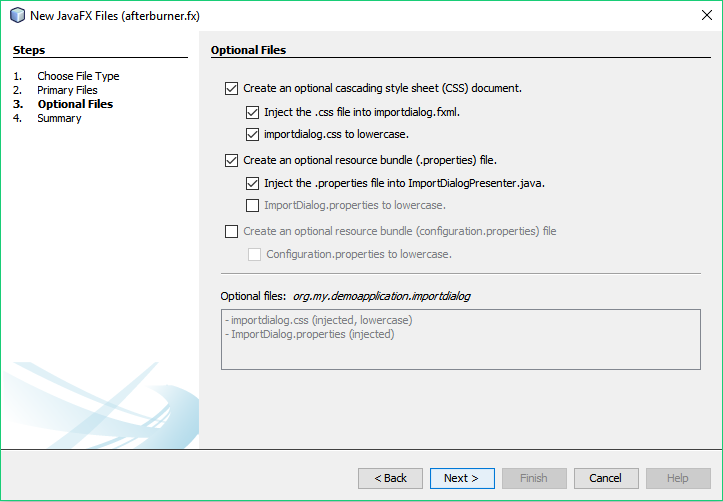 The NetBeansIDE-AfterburnerFX-Plugin is a `NetBeans IDE` plugin which supports the file generation in `convention` with the library `afterburner.fx` in a `JavaFX` project. In the case that the last `packagename` is `configuration` the option to create the `configuration.properties` file is in the page `Optional Files` deactivated. A warning is shown to inform the user about this topic. Checks if the new version compatible with NetBeans 8.2. 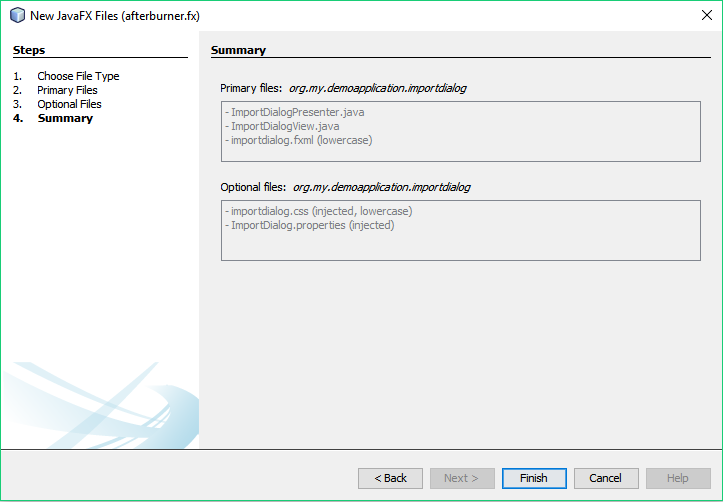 #60 [NetBeans] Check new version for compability in NetBeans 8.2. #56 [Wizard] Extend the generated fxml file with additional inclusion. #50 [Optional Files] Special case -> package name is configuration. #59 [Template] Refactore the templates. #52 [Wizard] Simplified the msg for the wizard. #49 [Wizard] Check the output messages in the wizard. #61 [Wizard] Prepare the plugin for the release 1.5.0. 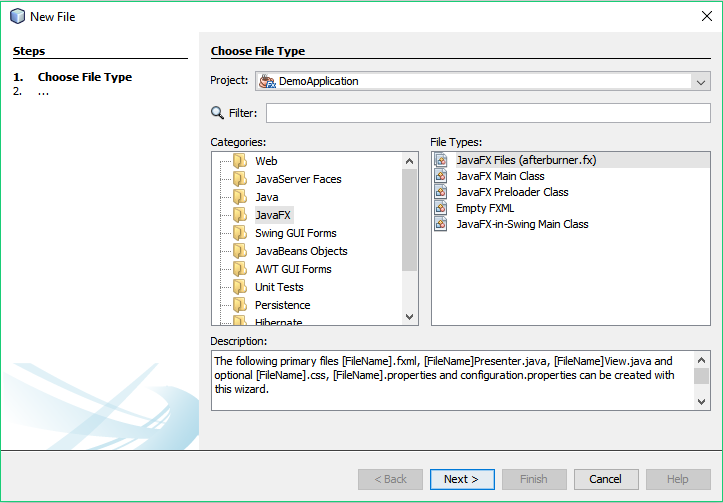 The following primary files [FileName].fxml, [FileName]Presenter.java, [FileName]View.java and optional [FileName].css, [FileName].properties and configuration.properties can be created in a new wizard. One conditional is that [FileName].toLowerCase() must be equals with the last choosen package name. For more information please see NetBeansIDE-AfterburnerFX-Plugin.